A well-designed, low weight, foldable stand that offers a lot of high end features, without the high end price tag. It’s quick adjustability, strong construction and stability make the Topeak Prepstand Elite Repair Stand a great buy not only for cyclists wanting to do repairs or maintenance at home, but also on the road. 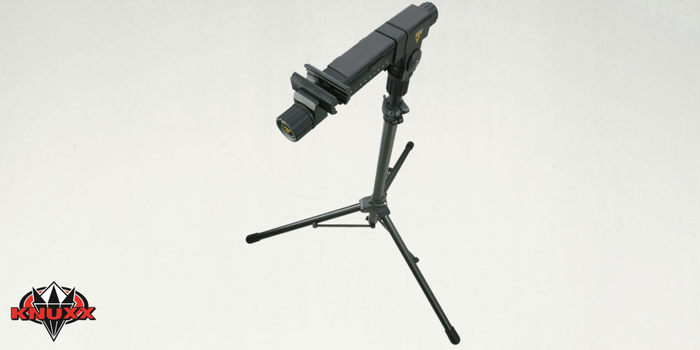 The Topeak Prepstand Elite Repair Stand is a lightweight, fully adjustable and foldable workstand. 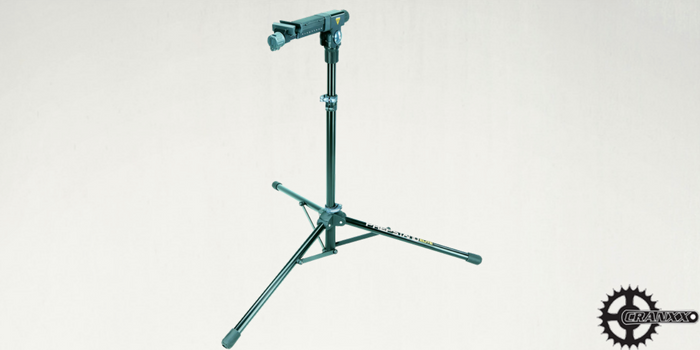 With a clamp head that can rotate 360 degress and quick release adjustable height from 48″-72″, this versatile and easy to operate repair stand will become your favorite. It also comes with a small parts bin and a carry bag. 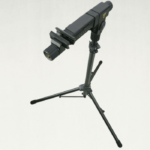 The Toppeak Prepstand Elite boasts 6061 aluminum construction and tri-pod base with a 53″ diameter. 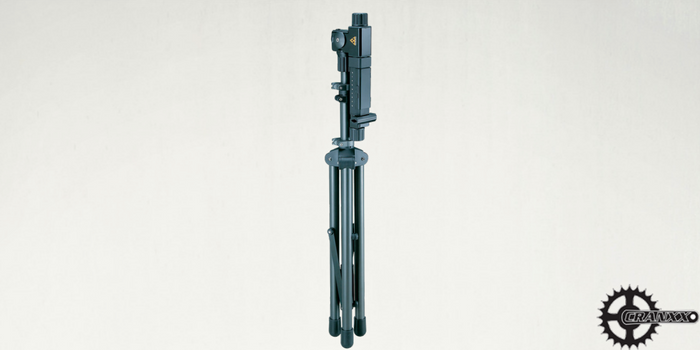 The rubberized tripod feet add strength and help to stabilize the base. It can hold even heavy bikes up to 55 lbs even though it weighs in at just over 13lbs. 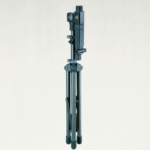 As mentioned earlier, height can be easily and quickly adjusted, along with the main rotating steel clamp head that can clamp up to 1.75″ in diameter. The clamp’s rubber jaws will not ruin your bikes finish and can grip any tube on your bike. When you’re finished working on your bike, the tripod base and arm fully collapse to roughly 7″ by 46″ making it easy to transport or store. Before you buy a bike repair stand, there are a few things you’ll want to consider. First you want to consider how stable and strong the stand will be. Will it wobble and can it hold up the types of bikes you will be working on without tipping? Will it continue to hold up overtime and with repeated use? Next, you need to consider the clamp and clamp head. Will it hold your bike on both the seat post and the top tube? Will it will adequately hold your bike without slipping in any position you need? Finally, if you are looking at foldable stands, you need to consider how it folds down and how portable it really is. Does it collapse fully and easily? Is it lightweight? With these questions in mind, we looked at the Topeak Prepstand Elite Repair Stand to find out how it stands up to other repair stands out there. Overall, we were impressed with the The Topeak Prepstand Elite Repair Stand. While it’s not the cheapest foldable work stand out there, it may be worth a little extra money if a superior design and construction are important to you. Set-up is quick and easy with this stand. Even when mounting several different types of bikes including heavier mountain bikes, the stand seemed solid thanks to the wide tri pod base with its rubber feet. 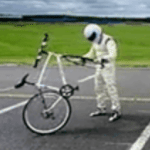 It only wobbled a little, which is to be expected with a foldable, portable stand, and then only when extra pressure or torque was needed for heavier tasks. But we didn’t have any issues with the bikes tipping and never felt that they would fall over. If you are planning to do a lot of heavier repairs and portability is not an issue than a fixed stand would be a better option. We also like that the stand is constructed of aluminum and the clamp head is made of a durable steel which means it will hold up to more use than cheaper stands with plastic components. It was easy and quick to adjust the stand to various heights with virtually any bike we tested. The rotating clamp head made it easy to mount either with the seat post or the top tube and we could position the bikes at any angle, even upside down, without any slipping. The rubber on the clamp protected the finish while holding securly. At first we weren’t sure if we would like the knob used to tighten down the main clamp, but after using it we found it easy to tighten down and again didn’t have any problems with the bikes slipping. We also liked how quick and easy it is to fold this stand down and that it really doesn’t take up much room when folded. The included carrying bag was of higher quality than expected and a nice little bonus. The stand is so lightweight that we could see that it would be easy to take to cycling events. While it is not the least expensive option out there, we feel that the higher quality construction and design features would be worth a little extra money especially if function and portability are important to you. 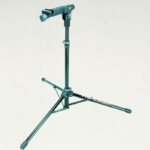 Rating: We’ve given the Prepstand Elite Repair Stand a 4.8 star rating. A little pricey, but a great foldable stand. Here’s the bottom line:The cyclist looking to make light repairs, adjustments or maintenance at home. This is not a stand for someone who frequently makes heavier repairs or a professional in a shop. 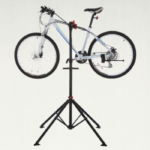 This is an individual review for the Prepstand Elite Repair Stand, if you want to read about the best Folding Workstands, then you need to check out our Best Workstands Review.